Chi-Fi is a term that usually denotes inexpensive, tube-based audio electronics built in China. Where a typical vacuum tube amp from an American or European manufacturer can be thousands of dollars, a similar Chi-Fi model might cost only hundreds. The build quality of Chi-Fi products is often not very high, though in some cases they can be. Styling is rarely the same because industrial design always seems to be the last thing that low-cost manufacturers mimic. Also, the features available are usually not the same. Chi-Fi integrated amps typically have just two inputs. Sound quality and performance can be variable, too. We reviewed the Music Angels Mengyue Mini integrated tube amp to see how it compares in general. While some North American merchants are importing Chi-Fi products and shipping them via UPS and FedEx—most notably under the Dared, GemTune, and Yaqin brands—many Chi-Fi products must be shipped directly from China. Shipping can often cost as much as US$100 and may take as long as a couple of months. And, of course, you're sending money from your PayPal account to someone halfway around the world, which is an experience that may make you hesitant. However, you can find quite a number of models on Amazon or eBay, so it's worth checking those sites first. Not only is the Meixing MC5S notable for being named after a notorious Detroit proto-punk band, but it's also one of the first tube amps we've seen that's intended for home theater and surround sound applications. With two big KT90 tubes per channel, the Meixing MC5S is rated at 70 W per channel. It's hard to tell from the company website, but this amp apparently has its power supply within a separate enclosure. Although it's difficult to speculate about the MC5S's performance, the 10 KT90s, five ECC83s, and five ECC82s can almost certainly create one of the hottest home theater amps ever. What is an Audio Processor and Fanmusic? After a quick read of the web page (and some semieducated guessing) we gather that the MTS-623 is a tube buffer stage; basically a simple preamp with a couple of 6N3 tubes intended to "warm up" the sound of CD players and other solid-state source devices. The mark of a serious tube amp (and a really devoted audiophile) is the use of exotic output tubes beyond the usual KT88s, EL34s, and 300Bs. This model, under the Audioromy brand, sports the FU29 tube that apparently was originally intended for use in broadcasting transmitters. Each tube is actually two tubes in one, which is a common arrangement in preamp tubes like the 12AX7, but something that's extremely uncommon in an audio power tube. We've seen this tube, or one pretty similar, used in high-end amps before, but those types of amps can carry a cost in the low five figures. The Audioromy model here is rated at 30 W per channel of pure Class A. The Dared MP-6 is a tube/transistor hybrid, with a smattering of gratuitous small-signal 6N2P tubes feeding a 40-watt-per-channel solid-state amplifier. Just hook up a pair of speakers, and you can stream audio from your phone, tablet, or laptop via Bluetooth. You can also connect your computer directly through USB or a set of headphones from the front 3.5 mm audio jack. You can do all this while watching the power meter on the front panel. Sadly, for lovers of cool audio gear (but perhaps happily for lovers of good sound), Chi-Fi doesn't offer many speakers. However, the Qinpu S-2 is one of the few that are particularly interesting. Three words: vintage horn speakers. The Qinpu S-2 might not sound that bad to most either. From the photos, the 9-inch-high speaker appears to have a 1-inch dome tweeter mounted inside a horn, with a 2-inch high-excursion woofer below it. You can get it in your choice of military green (shown) or bright red. We had the opportunity to check out the Qinpu's Q-2 hybrid tube/transistor amp, and we were pretty impressed at the sound it mustered from a mere 2 W. You can grab a pair for US$200. For reasons we don't fully understand, almost all Chi-Fi products are tube-integrated amplifiers. You might think that such a retro-oriented field might embrace vinyl records more, but no. 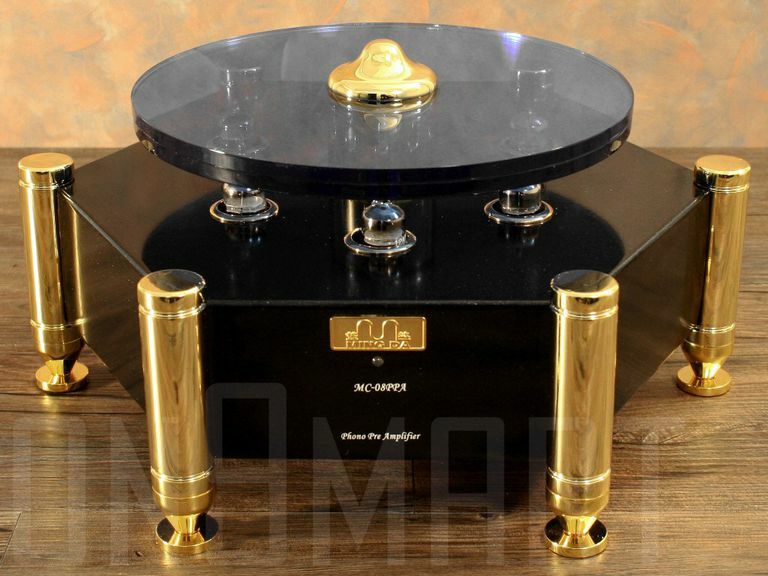 In fact, the only interesting Chi-Fi phono preamp we could find is the Meixing MingDa MC-08PPA. At a price of almost US$600, it's a long way from affordable. To be fair, the MC-08PPA's build quality looks worlds better than that of most Chi-Fi products, even if the design is a little cheesy, but it's definitely fun to look at. For whatever reason, Chi-Fi manufacturers haven't fully embraced the preamp, preferring to concentrate on integrated amps with preamp and amp housed in one single chassis. However, we did find the Dared Imperial Series DL-2000. This unit packs some classic preamp tubes—dual 12AX7s and a 12AT7—and it even has a real 5Z4P tube rectifier instead of the solid-state rectifier bridge used in many modern tube products. The DL-2000 also has a winning design that would look right at home in any sci-fi movie. Sadly, though, it's priced more like a typical preamp from an American or European manufacturer. The Wistao Technology WVT2015 is an audio product with a jet-age vibe. This is a hybrid amp with two de rigueur 6N3 preamp tubes and a 60-watt-per-channel solid-state power amp. Not only does the Wistao WVT2015 have three stereo inputs, which is an extravagant luxury with Chi-Fi amps, but also features a USB port and SD card slot so you can play digital audio files. One thing you certainly expect of the WVT2015 that you can't of most audio gear: People will ask you what the heck it is.